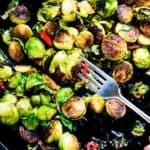 Pan-seared Brussels sprouts become deeply caramelized when they are seared in a cast-irPan Seared Brussels Sprouts with Soy Glaze and Chileson pan on the stove top. Finish them in a hot oven to make them perfectly crisp-tender. The stray leaves become browned and crispy-crunchy in the oven for an added bonus. These are tossed in a sweet-savory soy glaze and get a kick of spice from slices of fresh red serrano chiles. Heat the oil in a large cast-iron skillet over medium-high heat. When the oil begins to shimmer, place the sprouts in the pan in a single layer, cut-side down. Add the garlic cloves and chile slices in between the sprouts. Season with salt and pepper. Cook without stirring or turning until the sprouts are well browned on the bottom. Using tongs, turn the sprouts over so that the cut sides are up. Transfer the skillet to the oven. Roast, stirring occasionally if needed, for about 10 minutes, until the sprouts are browned and tender and the stray leaves are crisp. While the sprouts are in the oven, stir together the soy sauce, brown sugar, and vinegar in a small saucepan and heat over medium heat, stirring frequently, until thickened to a glaze. Remove from the heat. As soon as the sprouts come out of the oven, add the soy sauce glaze to the skillet and stir to coat the sprouts well. Serve immediately.